Since Blu-ray and DVD disc are easily damaged or scratched, it is very essential for you to backup Blu-ray/DVD movies. If you are looking for a money saving, invisible, safe and accessible way to store Blu-ray/DVD, OpenDrive can be your great choice. Similar to other cloud storage service, OpenDrive emphasizes more on saving and managing data. If you upload Blu-ray/DVD to OpenDrive, you can make a backup copy of all your precious movies and videos online, and then make your movie library available and accessible through your computer, phone and tablet - anytime and anywhere. The following article will guide your through the process with detailed steps. Here we go! To Upload Blu-ray DVD to OpenDrive, Convert Blu-ray/DVD to Digital Files First! As you try to upload Blu-ray/DVD discs to OpenDrive, the fact is that you usually get an error since almost all the Blu-ray/DVDs are protected with encryption, which prevents unauthorized access to Blu-ray/DVD disc and the playback of Blu-ray/DVD media using unauthorized devices. That is to say, you can't copy Blu-ray/DVD movies to OpenDrive directly. To make a copy or backup of the data on Blu-ray or DVD disc to OpenDrive, you need to bypass that copy protection and convert Blu-ray/DVD to digital formats with some special tools. Pavtube ByteCopy is precisely the one which will get your work perfectly completed. This program not only helps to bypass all the copy and region protection from all Blu-ray/DVD disc, BDMV/Video_TS folder, ISO/IFO image but also gives you the chance to convert Blu-ray/DVD to any popular video/audio file format for uploading to OpenDrive. - Full disc copy of Blu-ray/DVD in original file structure with all the subtitle languages, audio tracks, chapter information, etc well preserved. 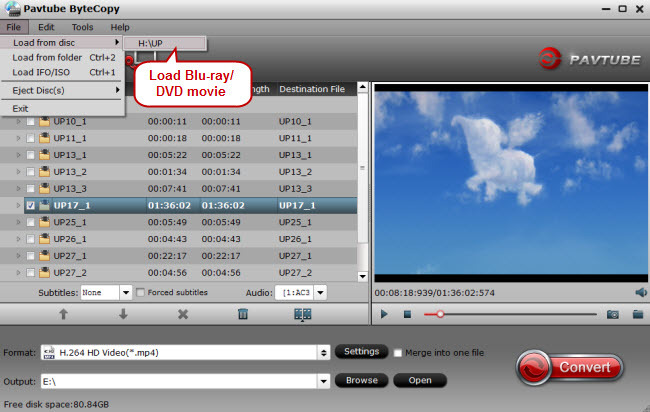 - Blu-ray/DVD to lossless multi-track MKV backup with desired subtitle languages and audio tracks. - Set subtitles in ripping process to select desired subtitles, enable forced subtitles or add external subtitles to Blu-ray/DVD movies. - Merge Blu-ray/DVD chapters into one. - Split large Blu-ray/DVD titles into small clips or segments. - Trim/Crop/Watermark/Apply effect to Blu-ray/DVD video. 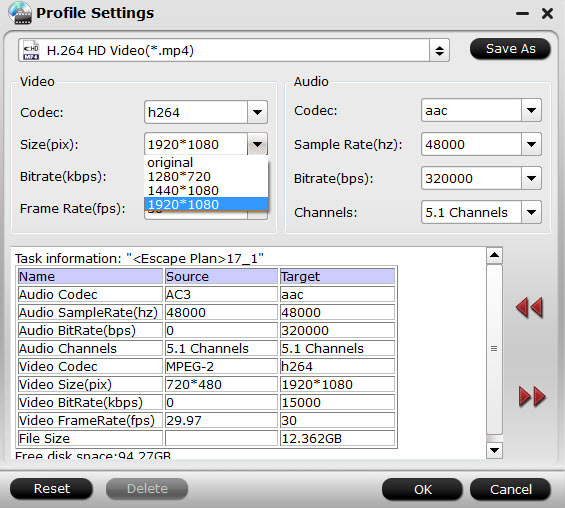 - Reduce Blu-ray/DVD video file size: lower the output video resolution, lower the bit rate, or lower the frame rate. Preparation: Download and install the Blu-ray/DVD to OpenDrive converter on your computer. Insert DVD into your computer's optical DVD drive, for loading Blu-ray disc, you will need an external Blu-ray drive. The click "File" > "Load from disc" to load Blu-ray or DVD disc into the program. BDMV/Video_TS folder, ISO/IFO image files are supported, too. 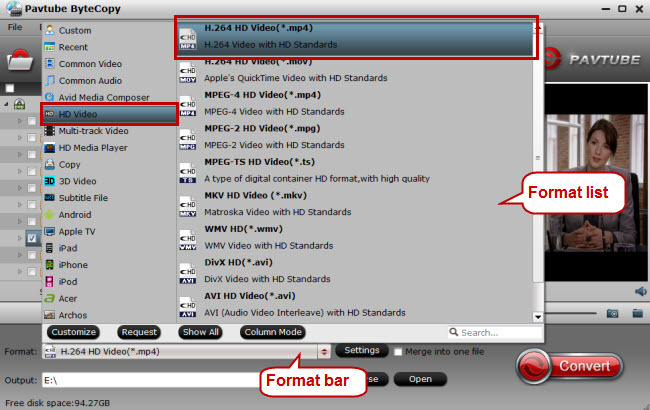 Click on "Format" bar to select "HD Video" > "H.264 HD Video(*.mp4)" format with good quality but smaller file size for OpenDrive. Also you can rip Blu-ray/DVD to External Hard Drive, Thumb Drive, SD Card, DropBox, etc for storage and playback. Click "Settings" to open "Profile Settings" window, you can change video resolution to a suitable file size, lower the bit rate 20-50% of the default to get small files or lower the frame rate to 15 or 10 fps. Then you can click "Browse" to choose any location on your computer disk as the destination to save the output files. Click "Convert" icon to start transcoding Blu-ray/DVD for OpenDrive. When the conversion is completed, you can have no problem to store Blu-ray/DVD on OpenDrive for viewing on computer, smartphone or tablets.